I have some good news to report this week. "Saul," which was published in Mindflights earlier this year, has been accepted at Anthology Builder. The site allows you to select stories from their library to create a custom anthology that will be sent to you as a soft-cover book. And the authors whose stories you choose get some compensation. I'm sorry to say that I haven't done much more work on "The Hand with the Knife." An editor asked for revisions on "Gethsemane," so I spent a couple weeks revising the ending then revising the revisions then revising again. I resubmitted and am anxiously awaiting the editor's verdict. She sounded excited about the story in her request for revisions so I'm feeling hopeful. I'm not sold on the ending I've worked out for "The Hand with the Knife." It's like a bad Western with the characters riding off into the sunset. 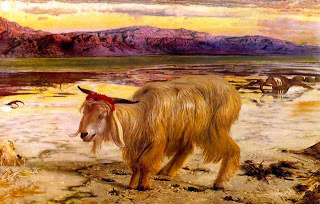 I'm putting it aside for a while to work on a different fairy tale entitled "Scapegoat." Yes, a goat does figure in the story. It's about a girl, her mother, a magical necklace, and vegetables. It's much more interesting than that sentence implies.